Foodista | Perfect Pies for a Picnic! Pies and picnics go together like sunshine and lemonade so start planning for a (gluten free!) picnic this Memorial Day weekend. While you can easily substitute store-bought pie dough in a pinch, here are two basic pie crust recipes from veteran bakers! You can also try Gluten Free Mama's Pie Crust Mix which makes for a light, flaky dough in literally minutes. Smitten Kitchen's Pie Crust 102: Really Flaky Pie Dough and Shauna's Gluten Free Pie Crust. What better way to celebrate Memorial Day than with apple pie? Adapted from Dorie Greenspan's fabulous recipe. 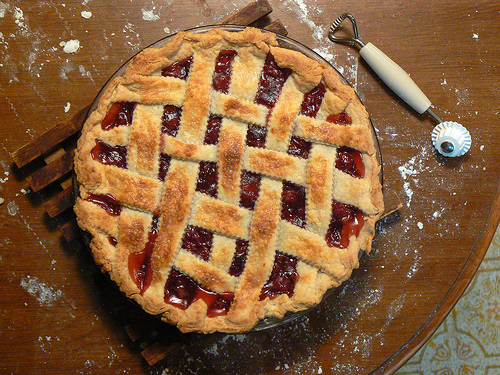 The perfect mix of sweet and tart, this cherry pie is just luscious! Baked in custard tins, these single-serving pies are perfect for on-the-go eating. Not quite feeling traditional pie? These pie bars are both portable and healthy with whole-grain oats! For a bohemian twist - try these mini-pies with creamy custard and aromatic spices. Definitely something different, this savory-sweet combo is great for a more grown up picnic. A Southern tradition, this boozy treat takes pie to a whole new level. This is making me crave pie! I often think of pie as a fall treat so this a great reminder that I can still be making pie this summer. I'm especially intrigued by the tea infused custard!